Is this not the only picture anyone ever shows us from the movie? It is definitely mostly a war movie. So I guess I will not be seeing it again, but I will give it four stars for being cast entirely of brilliant actors and actresses. Wait, is this a war movie? How did I not know this was a war movie? Is that BurtLancaster or Montgomery Clift? Debra Kerr's husband is a real jerk. Who's going to have an affair with Deborah Kerr? Oh, Burt Lancaster. Why does everyone want Montgomery Clift to box so much? Why are they torturing him like that until he agrees to be on the boxing team? What's the big deal? *Make ingenious cardboard inserts to keep spice drawer in order. So that famous scene on the beach is only five seconds? Hey! That's Donna Reed!!! Is she a cooch dancer, or just a companion? 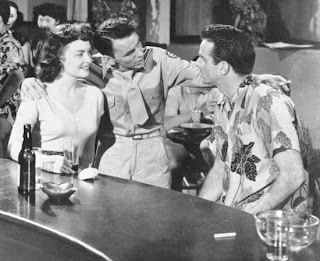 Oh, Montgomery Clift, does Donna Reed really love you? Oh Frank Sinatra. Things just aren't going to end well for you. You can't run off and get drunk during guard duty. Oh no!!! Oh no!!! Frank Sinatra!!! I didn't know this was going to be a sad movie!!! *Pack up left-overs to put them in the frig. Hey, it's the night of Dec. 6th. The Japanese are about to bomb, aren't they. How did I not know this was a Pearl Harbor movie? Oh no!!! Why is Montgomery Clift doing that??? Why is he being so stupid? Now everyone's going to be unhappy. It's one of those movies. If all of that sounded a little disjointed, it's because that's how my viewing was. Thank you to my roommate Barbara for being so willing to answer all of my, "Wait, wait, what just happened?"s. Maybe I should give the movie another chance. I enjoyed your comments on this film. War movies aren't everybody's thing. Personally I love them. I grew up watching so many of them with my dad, brother, friends, uncles, you name it. This is one of those films that people should see at least once. It is a classic. That does seem to be the iconic picture from the movie that everybody sees.